In this post: If you’re searching for bathroom ideas on a budget, look no further than spray painted porcelain tile for a complete bathroom transformation. When we moved into our home many years ago, much of the house was in its original condition. We had bought it from the initial owner, a builder who had it constructed in 1948. Given its dire need for an update, we set about renovating over the ensuing years, until we got to the point where almost every nook and cranny had been reworked. All, that is, except for a secondary upstairs bath. The room was a decent size with both bath and shower, but with black and blue tile that screamed “1948” and fixtures and details that were even worse, it was finally time to give this room some well deserved attention. The one complication was that we were beginning to think about moving, so we weren’t sure just how involved we wanted to get with this renovation. After much thought and compromise, we came up with a “bandaid” solution that we could live with if we stayed, but that cost far less than what we would have spent had we been 100% committed to the project. I wish I had better “before” pictures to share, so I could better illustrate just how transformative the change was. Here’s an old shot of the room that can at least give an idea of the tiling. We replaced the dark hollow doors years ago and had prettied the room up as best we could with floral curtains and such. But still the tile and ancient detailing remained. What follows are some of our bathroom ideas on a budget. The most significant but simple change was realized through the tile. We knew we wanted to lighten it up, but gutting the room and putting in new marble would have been quite costly, so we settled on having the walls, tub and shower porcelain sprayed. The floor we replaced, as well as vanity and commode and added all new brushed nickel fixtures, as well. I wanted the room to be a fresh white base with crystal and a mix of metals to add a bit of glimmer. 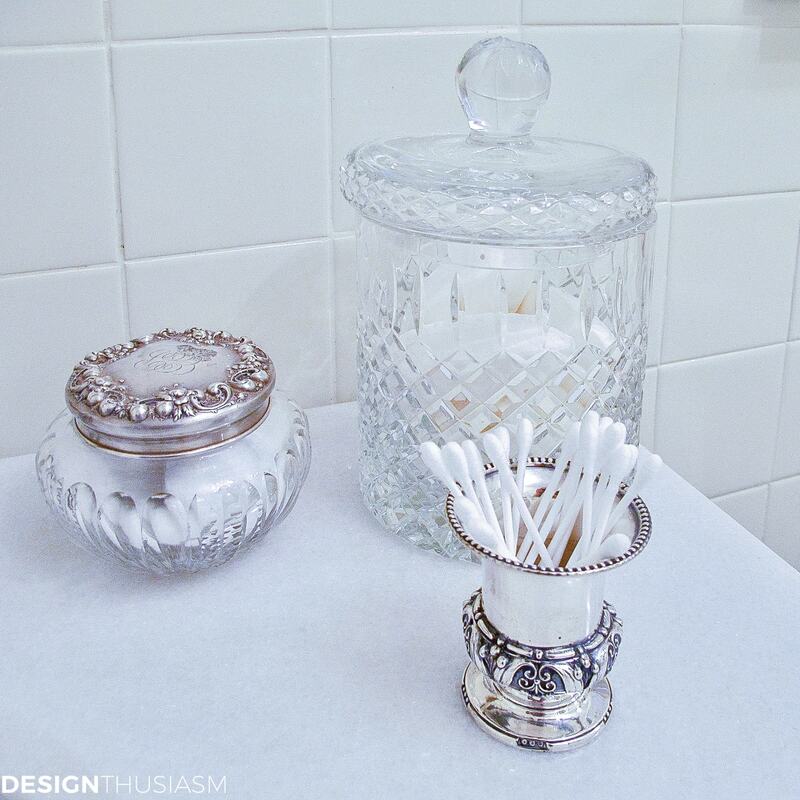 I spent some time finding antique accessories that would dress the room up, while serving a practical purpose, here holding Q-tips, cotton balls and guest soaps. The focal point of the room became a large vintage mirror hung over the bath, with crystal lighting reflecting in the gilt framed glass. I really wanted the chandy hung over the tub, but the electrician advised that that wasn’t up to code. 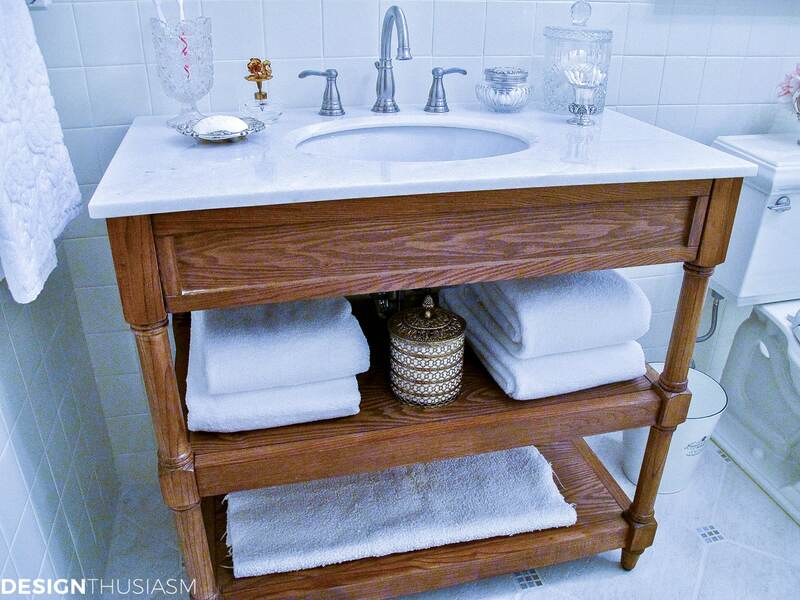 The vanity offers open shelves with neatly presented crisp white towels. 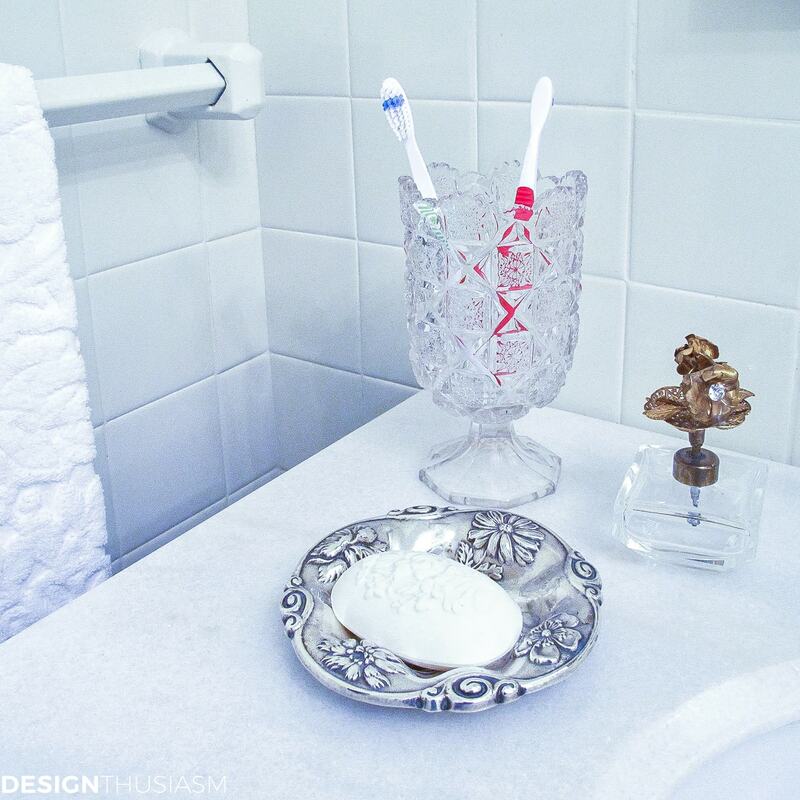 A vintage bathroom tissue holder rounds out the picture while providing a practical function. 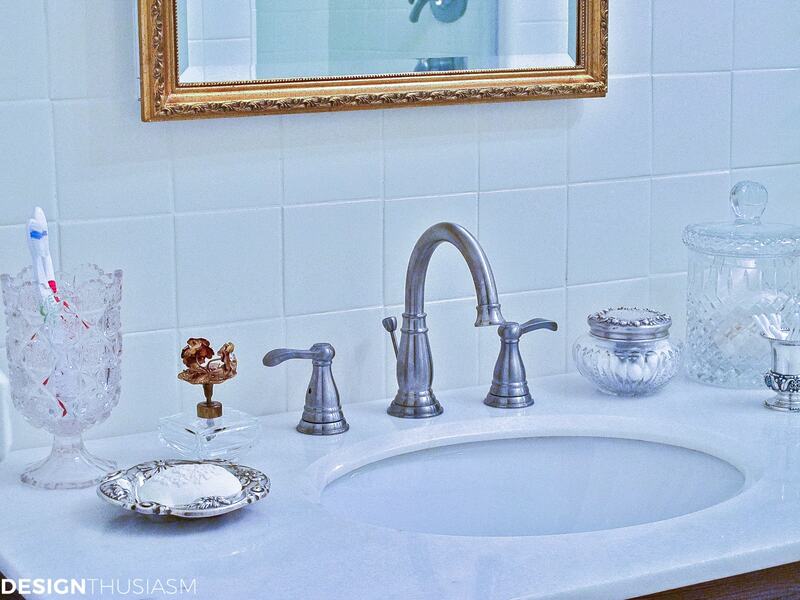 Rance soaps in a silver dish add flourish to the vanity while an antique perfume bottle sits nearby. Sculpted white hand towels mirror the pattern in the soaps. 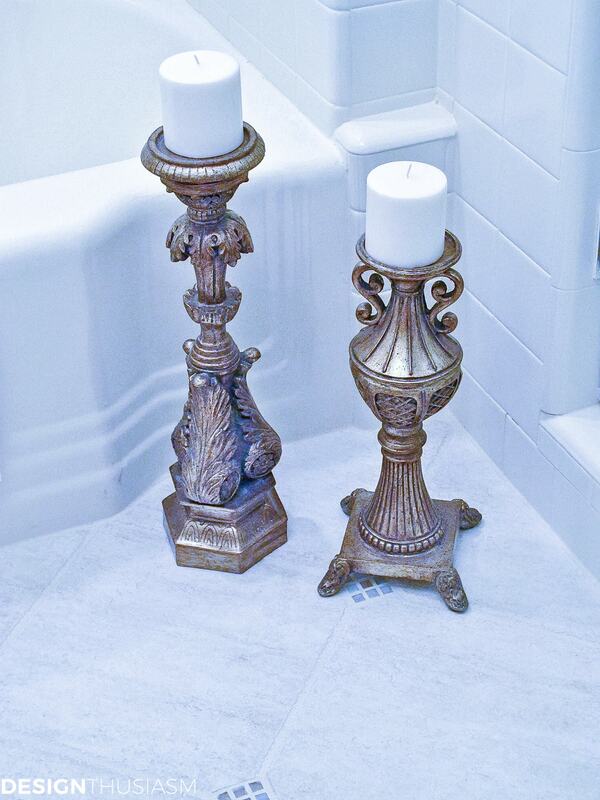 I have these tall candlesticks all over the house, so I ordered five more to frame the bath. 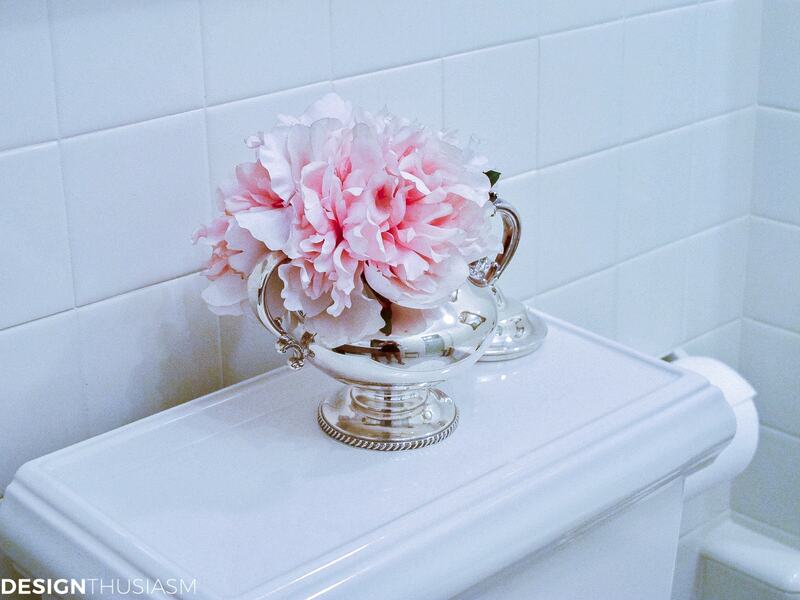 A silver sugar bowl with pink peonies lends a delicate warm touch to the bright room. We still haven’t decided whether to stay or go, but I enjoy the room now when I pass it in the hall. A lovely renovation, very pretty. Did you remove the old tiles yourself? Thanks, Lee. Actually, we didn’t remove any tile. The old tile on the walls and in the shower was just sprayed by a company that specializes in porcelain spray. Not sure how long it will last, but it’s a guest bath that doesn’t get much use. The floor tile is new, but it was laid right on top of the old tile. That’s what kept the price down. Hi Cindy! Thanks for your comments. I’m so new to this. Would love to share at Amaze me Monday… 🙂 Heading there now! Porcelain sprayed? I have never heard of that! I just went on Google to look it up, and it sounds like a way to get what you want without quite so much expense. Hmmmm….thinking about our kitchen and the changes I’d like to make in there! The mirror over the tub is FAH-bulous!!! What a beautiful way to set it! 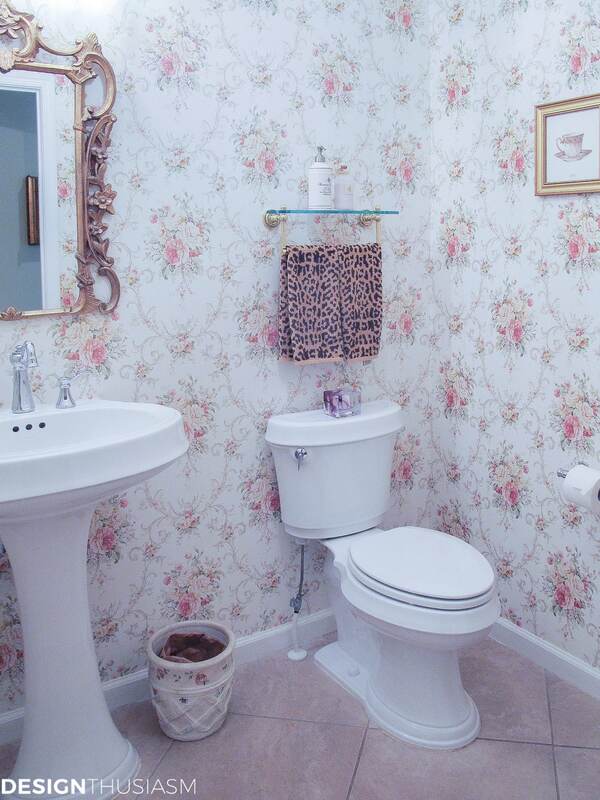 You really have made a wonderful statement with this bathroom! Thank you so much Alycia!! Yes, the spray was a huge epiphany and money saver. I’d seen it done successfully before, so I knew it was worth a shot. I’d be careful about using it in a well used room though, because it probably chips pretty easily. Ours has held up perfectly in the months since we did it, but when we were first renovating, we had the shower door replaced and the installation caused some chipping. Fortunately the spray company takes this into account and you are entitled to a touch up once your renovation is complete… 🙂 And yes, I much more enjoyed the accessory shopping to picking out faucets! Wow, Lory, this is gorgeous and looks like way more than a bandaid fix. I love it!! Gorgeous bathroom Lory and I adore that you hug the mirror in the shower! That is genius…. Thanks Christine! There actually is a separate stall shower on the right side of the room, so right now that’s just a tub. But it used to have a shower head in it, as well. That’s right – when we bought the house there were two showers in this room! 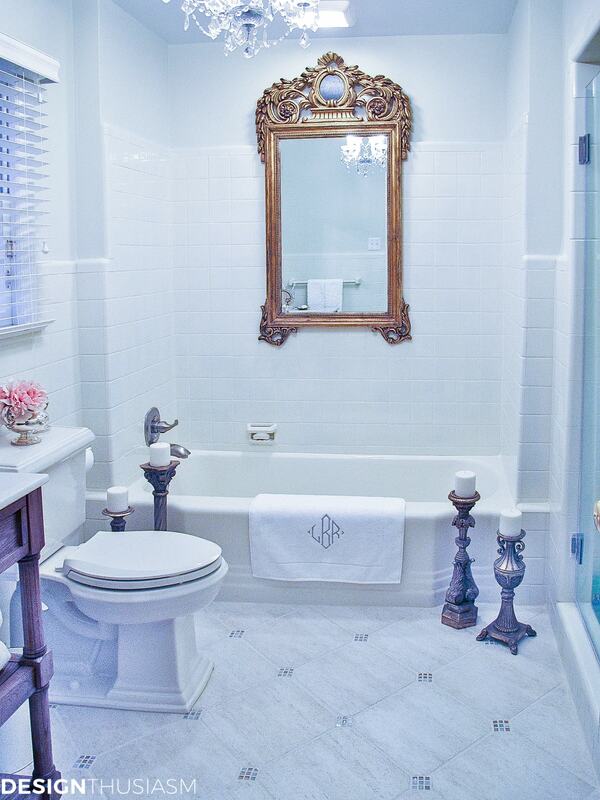 A very lovely remodel…and I think that white for a bathroom is the best. So clean looking. I have white bathrooms…except for wall paint. Everything else is white. Visiting from MyKentuckyLiving. This looks great, Lory! Beautiful transformation! 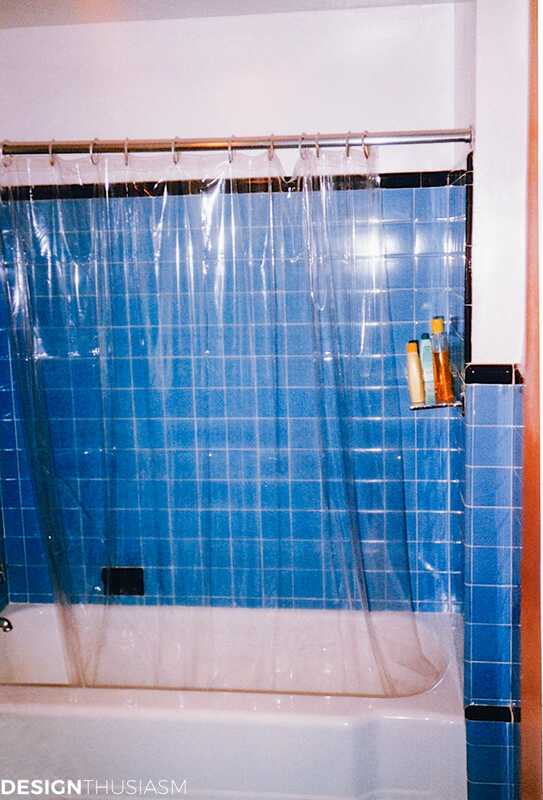 My hubby sprayed the blue shower tiles in the master bath of a 50’s home, we recently renovated for our girls. It really makes a world of difference! Your bathroom is stunning! a beautiful renovation. 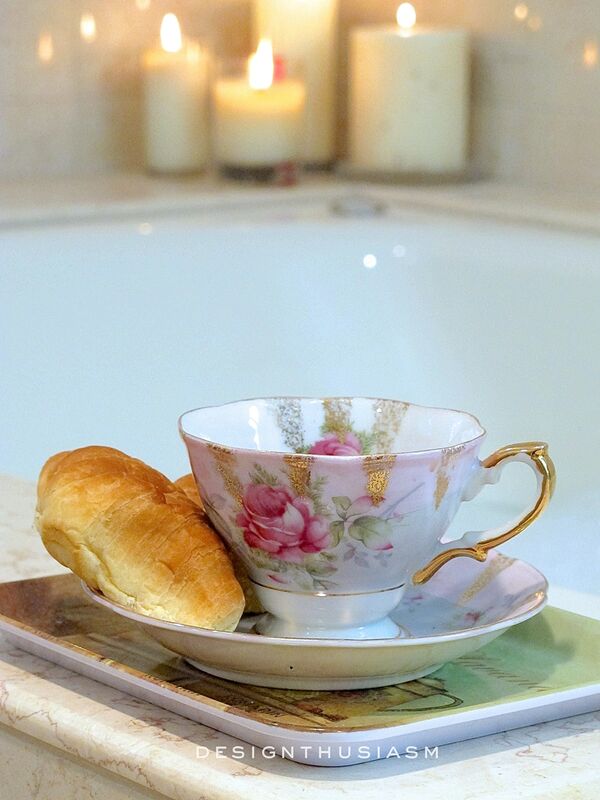 The candlesticks are a lovely addition to your elegant bath. Hugs! This came out beautifully. A very calming, serene space. Love it. Well done – it looks amazing. I cannot even believe it is the same space, wow!!!! Thanks Gee! I doubt it would hold up to a lot of use, but for the guest bath it’s been fine so far. We did it about 6 months ago. Thanks for stopping by and taking the time to comment! 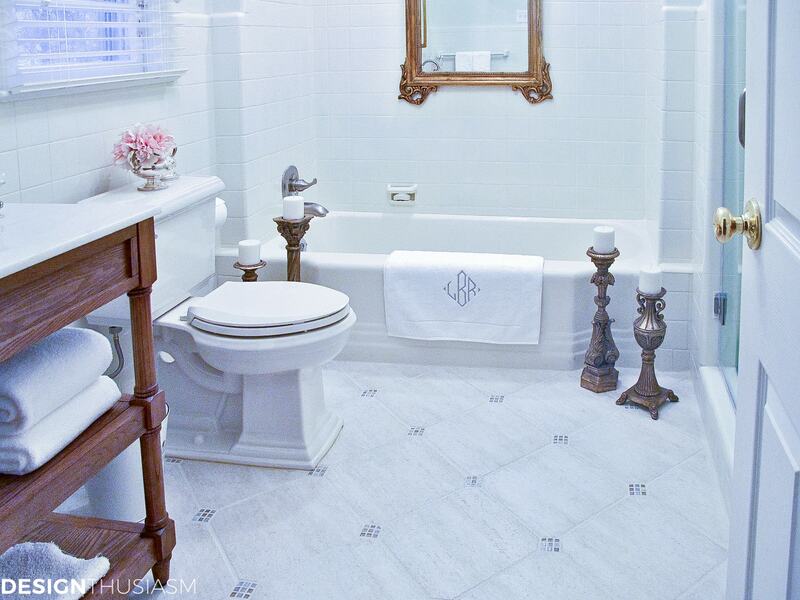 You really gave your bathroom a wonderful fresh and updated makeover! Love all the pretties sprinkled around. porcelain sprayed? I’ve never heard of that. I’m tempted to make a room all blue but reno is so much work. Your bathroom is divine! 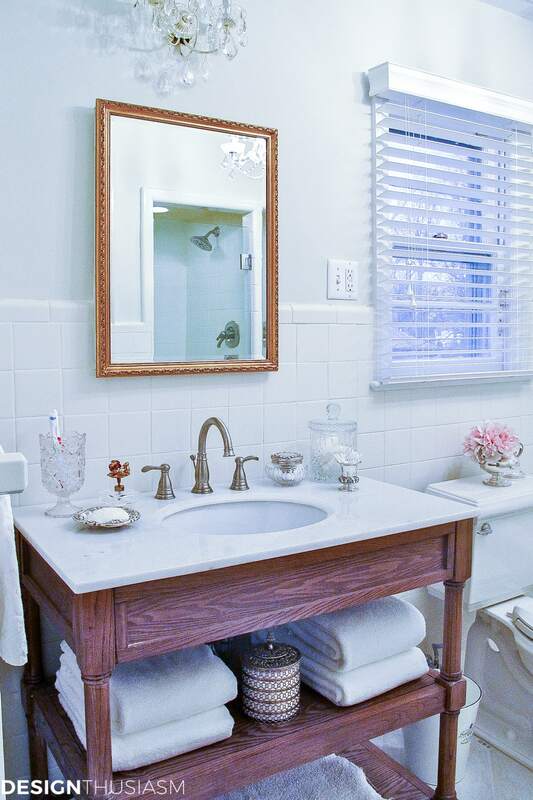 I love your vanity and that mirror over the tub. Thanx for joining THT! Thank you Pamela! And thank you so much for hosting… 🙂 I really appreciate you taking the time to comment!! 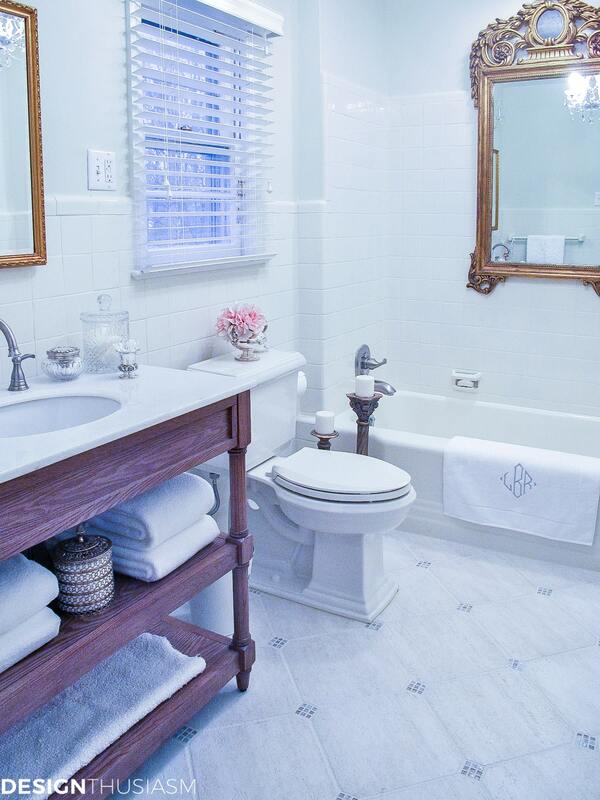 Beautiful bathroom redo! Where did you get the mirror over the tub and vanity? I am so inspired by your bathroom. Didn’t realize tile could be painted. thanks for the tips and inspiration. Thanks Becky! Yes, we sealed it but actually the grout is not new. It was just sprayed over when they sprayed the tile. Since we were putting in a new floor, the our tile guy did all the sealing. Also, I need to underscore that this is a guest bath, so doesn’t get a whole lot of showering use. But so far in 6 months it has held up perfectly. Absolutely stunning! Can you tell me where you purchased the floor tiles? Brand? Pattern Style Number? Manufacturer Color Name? Thank you so much! Hmmm… would have to dig out the box of extras to see, but it’s a porcelain tile meant to look like tumbled marble. The corners are an iridescent glass mosaic. If I have a chance I’ll come back and give you more info. Btw, forgot to say thanks!! 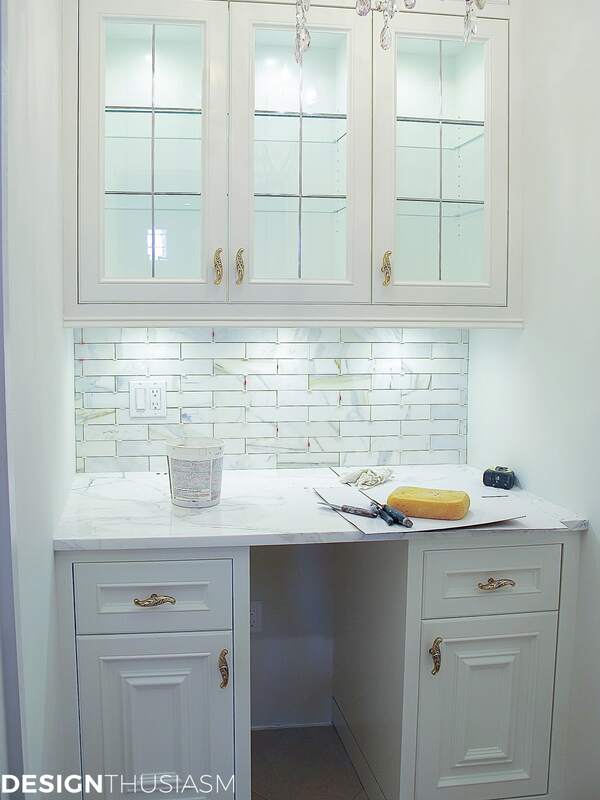 And the tile was from a local store – Short Hills Marble and Tile. This sounds like a great idea. Ours looks kinda like yours did! Oh gosh, I can’t remember but it’s by the square foot. It’s not exactly cheap, but it’s WAY cheaper than knocking out all the tile and putting in new. I have been thinking about this as a solution now that I have seen how great your bathroom looks! Can you tell me how bad the toxic fumes were, and how long they lasted? Thanks Teri! You definitely need to open the windows upstairs, if that’s where your room is, but it wasn’t unbearable. Was much better by the next day. Ok, you are the first I have seen use the porcelain spraying….how was the process?? how long did it take? Will it last do you think?? I have old tile and tub also, 1959. I’ve been thinking about it, so what company did you use?? Thanks, Nancy! Here’s the deal on the spraying. Process was easy to deal with. Hired a local company – they came in and did it in one day (took a couple of hours). Had to keep the windows open for a day or so, so I wouldn’t do it in the winter. Then, they told me to have all my other work done in the room, and then they would come back at the end and do a final touch up. The only place I needed that was when I had the shower door installed, the installer chipped the spray (as well as my wall!) The touch up was included in the initial price and worked fine. It still looks great today and we did it at least a year ago. BUT that said, I would not do this in a bathroom you use frequently. This is a bath that used to be my kids’ and now is a guest bath. It is rarely used except for when then kids come in and even then, they still prefer to use my shower. So I would say it’s a great option for either a room that’s not often used, or as a temporary solution to hold off a more complete renovation. I doubt it would hold up well with prolonged use. It does look really great though. It was SO ugly before! Hey Lory, We are currently working on our upstairs bathroom reno. We ended up having to mostly gut ours because of plumbing problems. We kept the old sink and tub and they’re being refinished. I love how your remodel turned out. 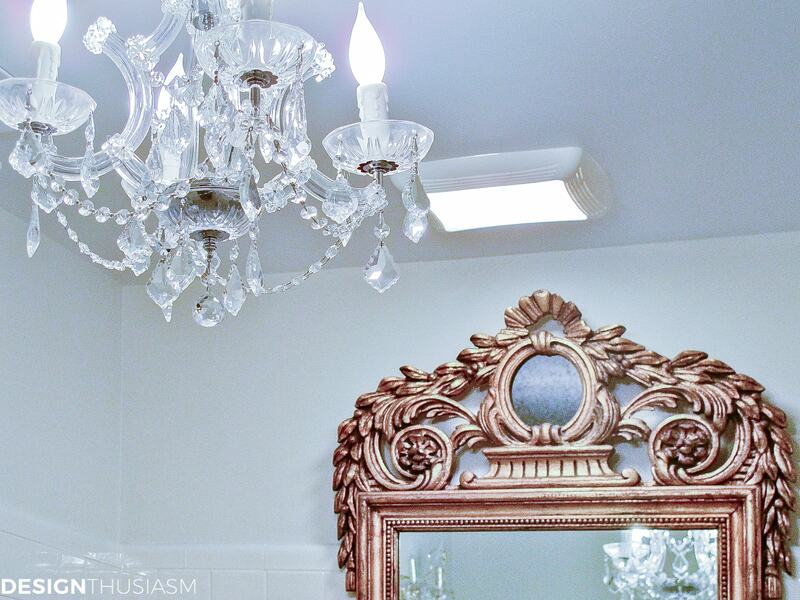 It has a light fresh look with a touch of drama from the beautiful chandelier and mirror. And those pink peonies have me dreaming of summer. Hopping over from Wow Us Wednesdays. Your bathroom is stunning. Love all the updates and decor. Thanks for the inspiration and enjoy your lovely space!